We casted off as planned. This time we were resolved that nothing can stopped us. The last three days were a real ordeal. From peace of a quiet bay we stepped right in the midst of a full-blown house-party. The Chinese New Year that’s nine days of national holidays, desperate traffic jams, every hotel in the favorite destinations is hopelessly over-booked, even small shrines and temples offer their meditation cells to tourists. Why would we go back to Kaohsiung at the peak of the busiest tourist period of the whole year? Why? We are moving on with our plans. 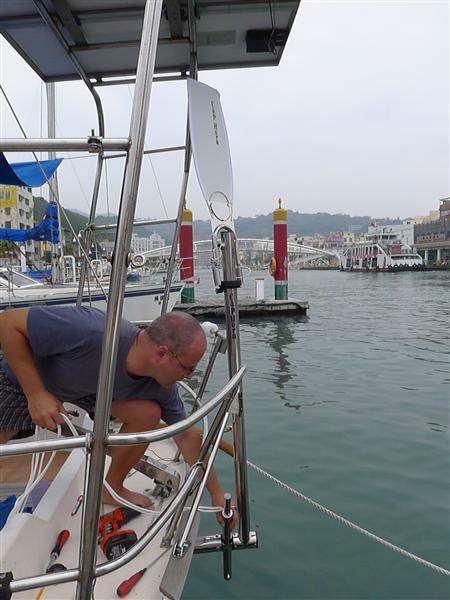 Today we have installed self-steering windvane Cape Horn. Now we can really take off towards that horizon! Cape Horn was invented and tested on a solo circumnavigation by Yves Gélinas, who made a very interesting film about the voyage.